Spoilers ahead for Enemy Territory! The adventures of the crew of the I.K.S. Gorkon continue in the third book of the series. Continuing to explore the Kavrot sector, one of their fellow Chancellor-class starships, the Kravokh, is attacked and destroyed by a ship hailing from a planet governed by the "Elabraj Hegemony." A civilization that has just recently acquired warp drive, the Elabrej have not encountered extraterrestrial intelligence until their fateful meeting of the Klingons. The Gorkon sets course to investigate this new world and to determine the fate of the Kravokh, and possibly avenge their deaths. The Elabrej turn out to be a non-humanoid species who find the Klingons as "weird" looking as they themselves are to the Klingons. I enjoyed this look at the Klingons (and by extension other "humanoid" species") through the eyes of an alien species who would find them repulsive. Star Trek has occasionally presented things from the perspective of the "other," most notably in the TNG episode "First Contact." As the novel progresses, we learn more about the Elabrej society and see the social stratification at work. I found their interactions with the Klingons to be a truly interesting juxtaposition to what we're used to with Starfleet crews encountering alien societies. The influence that the Klingons have on their society flies in the face of the values we usually see espoused in a Star Trek novel, but since this series focuses on the Klingon perspective, that seems to very much be the point. The characters of I.K.S. Gorkon continue to impress me in this novel. Wol in particular is an absolute joy to read about. 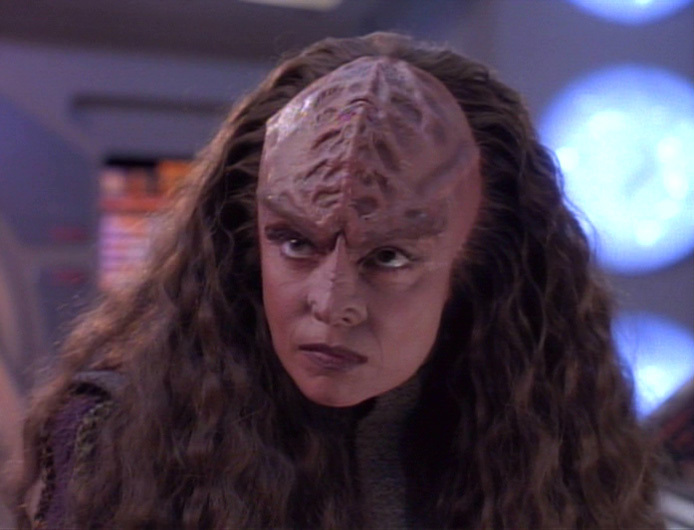 As leader of the 15th squad of the Gorkon's troops, she provides a fascinating glimpse into the lives of the Klingon "ground-pounders," a perspective we don't usually get, as most Trek stories, Klingon or otherwise, tend to focus on the officers. In Enemy Territory, she has the challenge of dealing with changes in her squad and being captured and experimented on by the Elabrej. Her subsequent escape and rescue of the remaining crew of the Kravokh cemented her in my mind as an all-time favorite character in Star Trek literature. After her ordeal in this novel, Wol bares her soul to her squad, and finds herself the subject of praise from them, even after admitting she was actually from a noble house and not the person they initially thought her to be. Kurak's trials and tribulations continue in Enemy Territory. Another character whose story is explored further in this novel is Kurak, the reluctant chief engineer of the Gorkon. A ship designer by trade, she was forced into serving the Klingon Defense Force due to familial obligations, and very much does not want to be serving aboard the Gorkon. Her severe depression over this has led her into becoming an alcoholic and exhibiting severe despondency, which is threatening her health and quality of life. This exploration of depression, from a Klingon perspective, was wholly unexpected and a welcome part of the novel. I suspect that a lot of people will find themselves identifying with Kurak's stuggle, as she feels trapped by forces beyond her control. The journey to mastering those forces and taking charge of one's life can seem to be an impossible one, and the pain that Kurak experiences in Enemy Territory certainly impacts her in destructive ways. Meanwhile, there is also a mutiny in the works on the Gorkon, led by crew who have transferred over from the I.K.S. Kreltek, a ship that fought on the side of General Talak in the previous novel, Honor Bound. Through this part of the story, we get to see how the security chief, Lokor, operates. He has access to a great deal of intelligence on the crew of the Gorkon, and utilizes any means necessary to get information and quell threats to the security of the ship to a quite frankly frightening degree. It is also opposition to this mutiny that finally prompts Kurak to pick herself up and perform her duty when she takes command of the Gorkon at a critical moment in the novel. Rodek's true identity seems to be threatening to come out. Finally, there is also movement on the Rodek story. 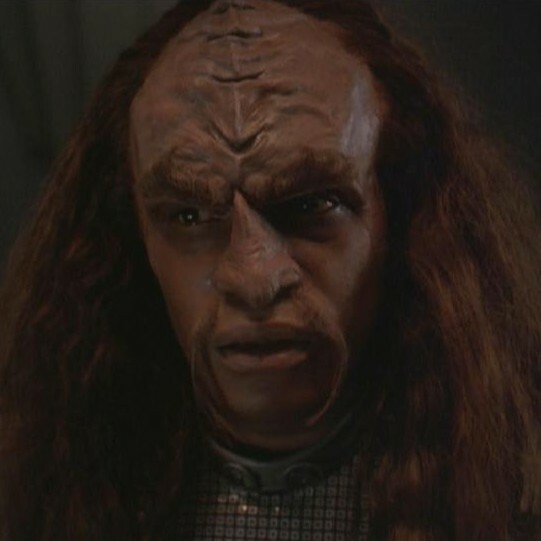 You may recall that "Rodek" is actually Kurn, Worf's brother, surgically altered and with his memories adjusted to lead a new life as Rodek when the House of Mogh was disbanded during Deep Space Nine, as seen in the episode "Sons of Mogh." Ever since an injury in an earlier I.K.S. Gorkon novel, Rodek has been experiencing flashes of memory of his life as Kurn, as well as gaining more confidence and a more forceful personality. While things don't come to a head yet in this novel, it's clear that his memories as Kurn are being set up to return to the forefront in the next novel. Enemy Territory continues the excellent I.K.S. 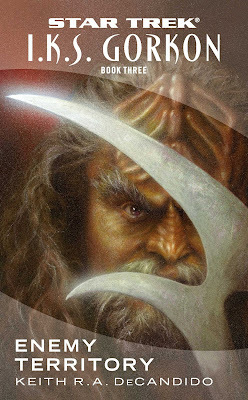 Gorkon series with terrific character development for this crew of Klingons whom I have come to love as much (if not more) than any of the Starfleet crews of other novel series. Keith DeCandido has managed to imbue these characters with a life of their own, and I find myself truly invested in the outcome of the lives of the crew of the Gorkon. Add to that the truly fascinating world-building and the story of cultures clashing, and Enemy Territory ends up hitting all the right notes for me. I.K.S. Gorkon continues to be one of my favorite corners of the Star Trek literary universe! Next up is my review of the third and final Star Trek: Prometheus novel: In the Heart of Chaos, the English translation of the novel by Christian Humberg and Bernd Perplies.